APEC organizers tried to keep Tuesday's summit in Manila centered on trade and economic development amidst intense world focus on terrorism following the Paris attacks and increased regional tension over territorial disputes. U.S. President Barack Obama and Chinese President Xi Jinping are among the many heads of state from the 21 members of the Asia-Pacific Economic Cooperation (APEC) who will attend the two-day leaders’ summit on Wednesday and Thursday. The American and Chinese leaders also took part in the G-20 summit in Turkey that focused on the coordinated terrorist attacks in the French capital that killed at least 129 people, and on Syria's four and a half year-old civil war that has given rise to the Islamic State terrorist organization, the group that claimed responsibility for the Paris attacks. While not on the APEC agenda, Philippine Secretary of Foreign Affairs Albert del Rosario said virtually every speaker at the ministerial level meetings held Tuesday addressed the issue of the Paris terrorist attacks. “Everyone expressed condolences to the families of the victims for the terrorist acts. There was a call for unity of nations and people. And there was additionally a call for bringing to justice those who perpetrated these horrific developments in Paris last Friday, said del Rosario. The Philippine foreign minister clarified, however, that there was no movement Tuesday for APEC to officially address the Paris attack or the threat of the Islamic State in the APEC region. Indonesia, the world’s most populous Muslim-majority country, suffered past attacks from al-Qaeda-linked Islamic militants, including the 2002 Bali bombings that killed 202 people, mostly foreign tourists. But the last major terror attack in Indonesia was in 2009 and security forces there have for the most part successfully dismantled those terror networks. The Philippines and Thailand also continue to fight Muslim-dominated separatist groups in the southern parts of their countries. 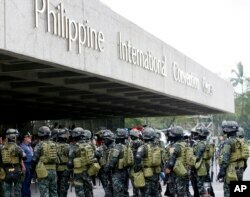 Philippine officials have stressed APEC security preparations. Manila declared a four-day holiday during the event, closings schools and many businesses. Nearly 1,400 flights have been canceled to accommodate the arrivals and departures of the attending leaders. Major roads near the meeting venues have been closed and over 30,000 police officers and soldiers have been deployed in the capital. The Philippine armed forces are also enforcing no-fly zones and maritime exclusion zones around APEC venues. The group Human Rights Watch on Monday criticized the Philippine government for apprehending and detaining hundreds of homeless people, including children, to clear the streets for APEC. Ministerial leaders on Tuesday agreed to move forward to develop the Free Trade Area of the Asia-Pacific (FTAAP), a multilateral free trade pact that is seen by many as a China led revival to the U.S. led Trans Pacific Partnership (TPP). The TPP free trade pact was recently agreed to by 12 Pacific Rim economies that include Japan and the U.S., but not China. Most other APEC members including South Korea, Indonesia and the Philippines have expressed interest in joining the TPP after the agreement is ratified and open to new members. Beijing, Tokyo and Seoul also recently agreed to develop free trade agreements amongst themselves and to push for a similar trade pact called the Regional Comprehensive Economic Partnership (RCEP). Philippine Secretary of Trade and Industry Gregory Domingo says APEC members see all these agreements as working towards the same goal of boosting more inclusive and comprehensive global trade. APEC members include major regional economies the U.S., China, Russia, Japan and South Korea, and together the group accounts for nearly half of all global trade and over 50 percent of world gross domestic product (GDP).